本发明涉及一种基于地理位置信息展示用户动态的方法及系统。 The present invention relates to a method and system for location-based dynamic user information display. 该方法包括以下步骤：SNS服务器获取第一SNS用户提交的个人动态信息及提交该个人动态信息的第一SNS用户所在的地理位置信息；根据该个人动态信息、地理位置信息及第一SNS用户标识号建立第一SNS用户个人动态信息数据库，并存储在SNS服务器中；所述SNS服务器在数据库中查找第一SNS用户的好友列表，将该第一SNS用户的个人动态信息、地理位置信息及第一SNS用户标识号通知给该第一SNS用户的好友列表中的第二SNS用户，并展示在第二SNS用户的好友动态中。 The method comprises the steps of: SNS server acquires dynamic personal information submitted by a first user and SNS submit geographic location information of the first SNS user personal dynamic information is located; according to the personal dynamic information, geographical location information and a first user identification SNS establishing a first number of the user's personal dynamic information SNS database, and is stored in the SNS server; the SNS SNS server looks for the first user's buddy list in a database, and the SNS personal dynamic information of the first user, the second location information SNS notifies a user identification number to a second user SNS SNS friend list of the user in the first, second and displayed dynamic friends SNS user. 上述方法及系统，获取第一SNS用户提交的个人动态信息以及地理位置信息，并展示在第二SNS用户的好友动态中，方便第二SNS用户查不同地理位置的好友个人动态。 The above-described method and system, access to personal dynamic information and geographic location information of a first user to submit the SNS and SNS displayed in the second user's friend activity, it is convenient to check the second friend SNS user personal dynamic geographically. 随着网络技术的发展，互联网应用越来越广泛，用户常通过移动通信终端在SNS 社区网中发表信息，以及与社区好友一起分享该信息。  With the development of network technology, Internet applications increasingly widespread, users often post messages on SNS community network through a mobile communication terminal, and share the information with the community friends. 其中，SNS(Social Networking Services，社会性网络服务）是指帮助人们建立社会性网络的互联网应用服务。 Which, SNS (Social Networking Services, the social network service) refers to the Internet application services to help people build social networks. 基于此，有必要提供一种基于地理位置信息展示用户动态的方法，方便用户查不同地理位置的好友个人动态。  Based on this, it is necessary to provide a location-based information to show the user a dynamic method, user-friendly personal friend Charles dynamics of different geographic locations. 所述SNS服务器在数据库中查找第一SNS用户的好友列表，将该第一SNS用户的个人动态信息、地理位置信息及第一SNS用户标识号通知给该第一SNS用户的好友列表中的第二SNS用户，并展示在第二SNS用户的好友动态中。  The SNS SNS server looks for the first user's buddy list in a database, and the SNS personal dynamic information of the first user, the location information of the user identification number and a first SNS notify the first user's buddy list SNS the second SNS users, and to show in the second friends dynamic SNS user. 根据该地理位置信息从所述第二SNS用户的好友动态中筛选出与该地理位置信息所对应的各好友的个人动态信息，并按照该地理位置信息排列显示第二SNS用户好友的用户标识号及好友的个人动态信息。  According to the geographic location information of the second dynamic filter from friends SNS user's personal dynamic information of each buddy out with the corresponding geographic location information, and displays the second information are arranged in accordance with the user's friends SNS location personal dynamic information and user identification number of a friend. 优选地，所述SNS服务器获取提交该个人动态信息的第一SNS用户所在的地理位置信息的步骤具体是：获取提交该个人动态信息的移动通信终端的地理坐标信息；根据所述地理坐标信息及地理信息系统，得出提交该个人动态信息的第一SNS用户所在的地理位置信息。 Step  Preferably, the SNS server acquires location information of the personal dynamic information submitted first SNS user resides in particular: acquiring the geographic coordinate information submitted personal dynamic information of the mobile communication terminal; according to the geographical coordinate information and geographic information systems, geographic information submitted to obtain the personal information of the first dynamic SNS user is located. 优选地，根据所述地理坐标信息及地理信息系统，得出提交该个人动态信息的第一SNS用户所在的地理位置信息的步骤具体为：将所述移动通信终端的地理坐标信息与地理信息系统中存储的地理坐标进行匹配，得出该移动通信终端的地理坐标信息所对应的地理位置。 A first step of SNS user's geographic location information  Preferably, according to the geographic coordinate information and geographical information system, the personal dynamic information submitted derived specifically: the geographical coordinates of the mobile information communication terminal with geographical coordinates stored in the geographic information system matches geographical coordinates obtained information of the mobile communication terminal corresponding to the location. 优选地，还包括步骤：设置所述第一SNS用户的个人动态信息的链接地址；将所述链接地址展示在第二SNS用户的好友动态中。  Preferably, further comprising the step of: setting the first link address SNS user's personal dynamic information; the dynamic link address displayed in the second friend SNS user. 此外，还有必要提供一种基于地理位置信息展示用户动态的系统，方便用户查不同地理位置的好友个人动态。  In addition, there is a need to provide a location-based information system to show the user a dynamic, user-friendly personal friend Charles dynamics of different geographic locations. 展示模块，用于将该第一SNS用户的个人动态信息、地理位置信息及第一SNS用户标识号展示在第二SNS用户的好友动态中。  Display module, dynamic personal information for the first SNS user, location information, and a first user identification number appear SNS friends dynamic second SNS user. 优选地，还包括查询模块和筛选模块，所述查询模块用于获取第二SNS用户选择的展示好友动态的地理位置信息，所述筛选模块用于从所述第二SNS用户的好友动态中筛选出与该地理位置信息所对应的各好友的个人动态信息，所述展示模块还用于按照该地理位置信息排列显示第二SNS用户好友的用户标识号及好友的个人动态信息。  Preferably, further comprising a query module and a filtering module, a query module configured to obtain a second selected display SNS user buddy dynamic geographic location information, said second filter means for SNS user's friends from dynamic screened personal dynamic information of each friend to the geographical location corresponding to the information, the presentation module is further for displaying the dynamic personal information of the user identification number and a second friend buddy SNS user location information in accordance with this order. 优选地，所述信息获取模块还用于获取提交该个人动态信息的移动通信终端的地理坐标信息，根据所述地理坐标信息及地理信息系统，得出提交该个人动态信息的第一SNS 用户所在的地理位置信息。  Preferably, the information obtaining module is further configured to obtain geographic coordinates of the mobile communication terminal information submitted personal dynamic information according to the geographical coordinate information and geographical information system, the personal dynamic information derived submit a first SNS user's location information. 优选地，所述信息获取模块还用于将所述移动通信终端的地理坐标信息与地理信息系统中存储的地理坐标进行匹配，得出该移动通信终端的地理坐标信息所对应的地理位置。  Preferably, the information obtaining module is further configured to geographical coordinates of the geographical coordinates of the mobile communication terminal and information stored in the geographic information system matching, the mobile communication terminal obtained geographic information corresponding to the geographic coordinates position. 优选地，还包括与所述展示模块相连的设置模块，所述设置模块用于设置所述第一SNS用户的个人动态信息的链接地址；所述展示模块还用于将所述链接地址展示在第二SNS用户的好友动态中。  Preferably, further comprising a setting module connected to the display module, the setting module for setting a first link address SNS user's personal dynamic information; the display module is further configured to link said address displayed in the second friends dynamic SNS user. 下面结合具体的实施例及附图进行详细的描述。  The following examples and with reference to specific embodiments in the accompanying drawings be described in detail. 步骤S100, SNS服务器获取第一SNS用户提交的个人动态信息及提交该个人动态信息的第一SNS用户所在的地理位置信息。  step S100, SNS server dynamically obtain personal information submitted by users and SNS first to submit location information of the first personal dynamic SNS user information is located. 第一SNS (Social Networking Services，社会性网络服务）用户通过移动通信终端向SNS服务器提交个人动态信息时，同时提交该移动通信终端所在的地理位置信息，即提交该个人动态信息的第一SNS用户所在的地理位置信息，如第一SNS用户通过移动通信终端（如手机）在深圳提交的大运会展望的个人动态信息。 When the  first SNS (Social Networking Services, Social Networking Service) users to submit personal dynamic information to the SNS server via a mobile communication terminal, and submit location information of the mobile communication terminal is located, i.e. the submitted personal dynamic information a geographic information SNS user's personal dynamic information such as the Universiade prospect of the first SNS users through the mobile communication terminals (such as mobile phones) submitted in Shenzhen. 个人动态信息是指用户发表的信息，包括但不限于SNS用户发表的博客、微博、上传的图片、评论的内容、回复的内容、分享的内容、参与的投票、参与的游戏或SNS用户个人信息的更新等。 Personal dynamic information refers to information published by the user, including, but not limited to, SNS users published blog, micro-blog, upload pictures, comment content, respond to content, share content, participate in voting, games or SNS user's personal involvement update information and so on. SNS用户个人信息的更新可为用户昵称的更改、用户头像的更换等。 SNS update users' personal information for the user to change the nickname, the user avatar replacement. 步骤S101，获取提交该个人动态信息的移动通信终端的地理坐标信息。  In step S101, the information submitted to the geographic coordinate acquiring personal dynamic information of the mobile communication terminal. 通过外部定位方式，如GPS (Global Positioning System，全球卫星定位系统）或通过电信移动运营商的无线电通讯网络，如GSM(Global System for Mobile Communications，全球移动通信系统）网、CDMA (Code Division Multiple Access，码分多址）网，获取移动通信终端的地理坐标信息。  by external positioning means such as GPS (Global Positioning System, GPS) or by a mobile telecommunications carrier radio communication network, such as GSM (Global System for Mobile Communications, GSM) network, CDMA (Code Division Multiple Access, Code Division Multiple Access) network, a mobile communication terminal acquires the geographical coordinate information. 步骤S103,根据该地理坐标信息及地理信息系统，得出提交该个人动态信息的第一SNS用户所在的地理位置信息。  step S103, the information based on the geographical coordinates and geographical information systems, the derived geographic location information submitted personal dynamic information of the first user's SNS. 获取了移动通信终端的地理坐标信息，结合GIS (Geographic Information System，地理信息系统），可确定该移动通信终端的地理位置，也就是提交该个人动态信息的第一SNS用户所在的地理位置信息。  Information acquired geographic coordinates of the mobile communication terminal, binding GIS (Geographic Information System, Geographic Information System), can determine the geographical position of the mobile communication terminal, i.e., a first geographic SNS submit the user's personal dynamic information where location information. GIS系统中存储有地理坐标信息与地理位置信息的对应关系。 GIS system stores a corresponding relationship between the geographic coordinate information and geographic information. 确定该移动通信终端断的地理位置信息的具体步骤为：将该移动通信终端的地理坐标信息与地理信息系统中存储的地理坐标进行匹配，得出该移动通信终端的地理坐标信息所对应的地理位置。 DETAILED step of determining location information of the mobile communication terminal is off: the geographical coordinates of the geographical coordinate information and geographic information system of the mobile communication terminal stored in the matching information obtained geographic coordinates of the mobile communication terminal corresponding to the geographical position. 如获取的移动通信终端的地理坐标信息为"北炜39. 9度、东经116. 3度"，根据该经炜度从GIS系统中查找匹配，确定该地理位置为"北京市区"。 Geographical coordinates of the mobile communication terminal acquires information such as "North Wei, 39.9 degrees, 116.3 degrees east longitude", from the GIS system find a match based on the degree by Wei, the geographic location is determined as "Beijing area." 步骤S200,根据该个人动态信息、地理位置信息及第一SNS用户标识号建立第一SNS用户个人动态信息数据库，并存储在SNS服务器中。  In step S200, the personal dynamic information based on the geographical location information and the identification number of the first user establishing a first SNS SNS user's personal dynamic information database, and is stored in the SNS server. SNS服务器获取到第一SNS用户通过移动通信终端提交的个人动态信息及地理位置信息后，需将第一SNS用户的个人动态信息、提交的该个人动态信息的第一SNS用户所在的地理位置信息以及第一SNS用户标识号（Identity，简称ID)建立一个对应关系，即建立第一SNS用户个人动态信息数据库，并存储在SNS服务器中，以方便查找。  After the SNS server acquires dynamic personal information and the location information of the first user SNS submitted by the mobile communication terminal, the user need the first SNS personal dynamic information SNS personal dynamic information of the first user, where the submissions a first location information and the SNS user identification number (the identity, referred to as ID) to establish a correspondence relationship, i.e., establishing a first user's personal dynamic information SNS database, and is stored in the SNS server, easy to find. 如表1所示，SNS 用户A的个人动态信息数据库中，SNS用户A在地理位置a处提交了个人动态信息1，在地理位置b提交了个人动态信息2,在地理位置c提交了个人动态信息3。 As shown in Table 1, the dynamic personal information database SNS user A, user A SNS submit a location at a personal dynamic information, the dynamic personal location information submitted b 2, presented in personal dynamic geographic c information 3. 具体例如SNS用户A的标识号为12345,提交的个人动态信息为"看亚运"，地理位置信息为"广州"，SNS用户A 的个人动态信息数据库中会记录一条"SNS用户A在广州提交的看亚运"的数据。 Specific examples of the identification number of the SNS user A is 12345, the dynamic personal information submitted to "look at the Asian Games," location information "Guangzhou" personal dynamic information database SNS user A will record a "SNS A user submitted in Guangzhou look at the Asian Games, "the data. 另外，当SNS用户A在地理位置c处提交新的个人动态信息n，则将SNS用户A标识号、个人动态信息n及地理位置c更新到用户A的个人动态数据库中，如表2所示。  Further, when user A SNS submit new personal dynamic information at the location c at n, then A SNS user identification number, a personal dynamic information and location n c dynamic database update to the individual user A, as shown in Table 2 shown in FIG. 步骤S300SNS服务器在数据库中查找第一SNS用户的好友列表，将该第一SNS用户的个人动态信息、地理位置信息及第一SNS用户标识号通知给该第一SNS用户的好友列表中的第二SNS用户，并展示在第二SNS用户的好友动态中。  Step S300SNS SNS server looks for the first user's buddy list in a database, and the SNS personal dynamic information of the first user, the location information of the user identification number and a first SNS buddy list is notified to the user's first SNS the second SNS users, and to show in the second friends dynamic SNS user. 该数据库中存储有各SNS用户的好友列表。  The database stores each SNS user's buddy list. SNS服务器在数据库中查找第一SNS 用户的好友列表，第一SNS用户的好友列表中至少有一个好友，该至少一个好友为第二SNS 用户，将第一SNS用户标识号、提交的个人动态信息及提交该个人动态信息的第一SNS用户所在的地理位置信息通知给该第二SNS用户，并展示在第二SNS用户的好友动态中，方便第二SNS用户查看。 SNS database server looks in the first SNS user's buddy list, buddy list of the first SNS users have at least one friend of the at least one second SNS user Friends, the first SNS user identification number, personal dynamic information submitted location information and submit the personal dynamic information of the first SNS user is notified to the second SNS users, and to show in the second friends dynamic SNS users, making it easy to view the second SNS users. 如SNS服务器在数据库中SNS用户A的好友列表中有SNS用户B和SNS 用户X，SNS用户A在北京提交的香山游记，具体包括SNS用户A提交的个人动态信息为游记的具体内容、地理位置为北京、SNS用户A标识号为"1234"，将分别展示在SNS用户A的好友SNS用户B的好友动态和SNS用户X的好友动态中。 SNS SNS such as servers friend list of the user A and user B has SNS SNS users X, SNS user A Beijing Xiangshan Travels filed in the database, including details of personal dynamic information SNS user A filed Travels, location as Beijing, SNS a user identification number "1234", will show multiple friends from your friends in SNS user B's friends SNS SNS user a dynamic and user X's. 在一个实施例中，上述基于地理位置信息展示用户动态的方法还包括：设置第一SNS用户的个人动态信息的链接地址；将该链接地址展示在第二SNS用户的好友动态中。  In one embodiment, the location-based dynamic user information presentation method further comprising: setting a first link address SNS user's personal dynamic information; the dynamic link address displayed in the second friend SNS user. SNS用户A提交的个人动态信息在SNS用户B的好友动态和SNS用户X的好友动态可为标题及链接的地址，获取到SNS用户B和SNS用户X触发该地址，则从SNS服务器的SNS用户A的个人动态数据库中拉取该个人动态信息的具体内容进行查看。 A dynamic personal information submitted by SNS users in user B's friends SNS SNS and dynamic user X's friend dynamically link the title and address, access to the SNS and SNS user X User B trigger the address of the server from SNS SNS users a personal dynamic database in the personal details of pulling dynamic information view. 表3为SNS用户A的好友SNS用户X的好友动态的具体记录。 Specific social updates records  Table 3 User A's friend SNS SNS user X. 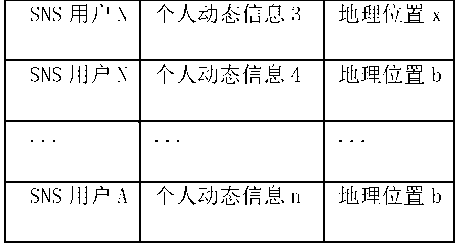 在表3中，SNS用户X的好友包括SNS用户A、SNS用户B、SNS用户E、SNS用户N 等。  In Table 3, SNS SNS user includes a user's friend X A, SNS user B, SNS user E, SNS user N and the like. SNS用户E在地理位置x提交了个人动态信息1，用户B在地理位置b提交了信息2,用户N在地理位置b提交了信息4,用户A在地理位置b提交了信息n。 SNS user E at location x 1 dynamic information submitted personal, user B location information submitted b 2, N users in geographic location information submitted b 4, the user A geographical information submitted b n.
 在优选的实施例中，上述基于地理位置信息展示用户动态的方法，还包括：SNS服务器获取第二SNS用户选择的展示好友动态的地理位置信息；根据该地理位置信息从第二SNS用户的好友动态中筛选出与该选择的地理位置信息所对应的各好友的个人动态信息， 并按照该地理位置信息排列显示第二SNS用户好友的用户标识号及好友的个人动态信息。  In a preferred embodiment, the above method show location information based on dynamic user, further comprising: a friend show SNS server acquires location information of the second dynamic SNS user selection; based on the location information from the second SNS dynamic user's buddy selected personal dynamic information of each friend and the geographic location information corresponding to the selected, displaying the personal dynamic information and user identification number and a second friend buddy SNS user location information in accordance with this order. 第二SNS用户在好友动态中选择一个地理位置信息后，从第二SNS用户的好友动态中可选出与该地理位置信息所对应的各好友的个人动态信息。 After the  second SNS user selects a location in the dynamic information in the friend, friend from the second dynamic SNS user's personal dynamic information may be selected for each friend to the geographical location information corresponds. 如，上述实施例中，第二SNS用户为SNS用户X，SNS用户X的好友动态中在地理位置b提交个人动态信息的好友的标识号以及该好友的个人动态信息如表4所示。 For example, the above-described embodiments, the second user SNS SNS user X, the user X SNS dynamic friends of friends to submit a personal identification number and personal dynamic information of the buddy dynamic information as shown in Table 4 at location b. 在表4中，SNS用户X的好友中在地理位置b提交信息的有SNS用户A、SNS用户B、SNS 用户N。  In Table 4, SNS user X Friends SNS user has submitted the information A, SNS user B, SNS user location b N.
 另外，第一SNS用户与第二SNS用户互为好友，第一SNS用户的个人动态信息会展示在第二SNS用户的好友动态中，第二SNS用户的个人动态信息也会展示在第一SNS用户的好友动态中，因此上述描述的对第一SNS用户和第二SNS用户的操作可互换。  Further, the first and the second user SNS SNS user mutual friend, the personal information of the first dynamic SNS user appear on the second dynamic friends SNS user's personal dynamic information of the second user will appear SNS friends dynamic first SNS user, so the user operation on the first and second SNS SNS user described above are interchangeable. 如图3所示，在一个实施例中，一种基于地理位置信息展示用户动态的系统，包括信息获取模块310、创建模块320、通知模块330和展示模块340。  As shown in FIG. 3, in one embodiment, a user display location information based on a dynamic system, it includes an information acquisition module 310, a creation module 320, a notification module 330 and display module 340. 信息获取模块310用于获取第一SNS用户提交的个人动态信息及提交该个人动态信息的第一SNS用户所在的地理位置信息。  The location information acquisition SNS user information of the first module 310 for acquiring first SNS user personal dynamic information and submit the submitted personal dynamic information is located. 第一SNS (Social Networking Services，社会性网络服务）用户通过移动通信终端向SNS服务器提交个人动态信息时，同时提交该移动通信终端所在的地理位置信息，即提交该个人动态信息的用户所在的地理位置信息。 Geography user first SNS (Social Networking Services, the social network service) users to submit personal information to the SNS server dynamically through the mobile communication terminals, and submit location information of the mobile communication terminal is located, that the authors of the personal dynamic information resides location information. 信息获取模块310获取该个人动态信息及提交该个人动态信息的第一SNS用户所在的地理位置信息。 Information acquiring module 310 acquires the dynamic personal information and submit geographic location information of the first personal dynamic information SNS user is located. 如第一SNS用户通过移动通信终端（如手机）在深圳提交的大运会展望的个人动态信息。 Universiade prospect of personal dynamic information, such as the first SNS users through the mobile communication terminals (such as mobile phones) submitted in Shenzhen. 个人动态信息可指SNS用户发表的个人日志、上传的图片或SNS用户个人信息的更新等。 Personal dynamic information may refer to a personal journal published by SNS users, upload pictures or update your personal information such as SNS. SNS用户个人信息的更新可为用户昵称的更改、用户头像的更换等。 SNS update users' personal information for the user to change the nickname, the user avatar replacement. 信息获取模块310还用于获取提交该个人动态信息的移动通信终端的地理坐标信息，根据地理坐标信息及地理信息系统，得出提交该个人动态信息的第一SNS用户所在的地理位置信息。  The information obtaining module 310 is further configured to acquire the mobile communication terminal submits the dynamic personal information of the geographical coordinate information, the coordinate information and the geographic information system, the derived geographic submit personal dynamic information of the first user's SNS information. 通过外部定位方式，如GPS(Global Positioning System，全球卫星定位系统）或通过电信移动运营商的无线电通讯网络，如GSM(Global System for Mobile Communications，全球移动通信系统）网、CDMA (Code Division Multiple Access，码分多址）网，获取移动通信终端的地理坐标信息。 By external positioning means such as GPS (Global Positioning System, GPS) or by telecommunications mobile operator's radio communications networks, such as GSM (Global System for Mobile Communications, Global System for Mobile Communications) network, CDMA (Code Division Multiple Access , Code Division Multiple Access) network, a mobile communication terminal acquires the geographical coordinate information. 信息获取模块310获取到地理坐标信息后，结合GIS (Geographic Information System，地理信息系统），可确定该移动通信终端的地理位置，也就是提交该个人动态信息的第一SNS用户所在的地理位置信息。 After the information acquiring module 310 acquires information to geographic coordinates, binding GIS (Geographic Information System, Geographic Information System), can determine the geographical position of the mobile communication terminal, location information is submitted to the first SNS user's personal dynamic information where . GIS系统中存储有地理坐标信息与地理位置信息的对应关系。 GIS system stores a corresponding relationship between the geographic coordinate information and geographic information. 信息获取模块310将该移动通信终端的地理坐标信息与地理信息系统中存储的地理坐标进行匹配，得出该移动通信终端的地理坐标信息所对应的地理位置。 Geographical coordinates information acquisition module 310 of the mobile communication terminal with geographical coordinate information stored in the geographic information system matches geographical coordinates obtained information of the mobile communication terminal corresponding to the location. 如获取的移动通信终端的地理坐标信息为"北炜39. 9度、东经116. 3 度"，根据该经炜度从GIS系统中查找匹配，确定该地理位置为"北京市区"。 Geographical coordinates of the mobile communication terminal acquires information such as "North Wei, 39.9 degrees, 116.3 degrees east longitude", from the GIS system find a match based on the degree by Wei, the geographic location is determined as "Beijing area." 创建模块320用于根据该个人动态信息、地理位置信息及第一SNS用户标识号建立第一SNS用户个人动态信息数据库。  The creation module 320 according to the dynamic personal information, geographical location information and a first user identification number to establish a first SNS SNS user's personal dynamic information databases. 信息获取模块310获取到第一SNS用户通过移动通信终端提交的个人动态信息及地理位置信息后，需通过创建模块320将第一SNS用户的个人动态信息、提交的该个人动态信息的第一SNS用户所在的地理位置信息以及第一SNS用户标识号建立一个对应关系，即建立第一SNS用户个人动态信息数据库，并存储在SNS服务器中，以方便查找。 The first SNS personal dynamic information of the information obtaining module 310 acquires the dynamic personal information and the location information of the first user SNS submitted by the mobile communication terminal, for an individual by the creation module 320 first SNS user dynamic information, submitted geographic information users are located and the first SNS users to establish a correspondence between the identification number, namely the establishment of the first SNS user's personal dynamic information database and stored in the SNS server, easy to find. 如表1所示，SNS用户A的个人动态信息数据库中，SNS用户A在地理位置a处提交了个人动态信息1，在地理位置b提交了个人动态信息2,在地理位置c提交了个人动态信息3。  As shown in Table 1, the dynamic personal information database SNS user A, user A SNS submit a location at a personal dynamic information, the dynamic personal location information submitted b 2, c submit geographic location 3 dynamic personal information. 具体例如SNS用户A的标识号为12345,提交的个人动态信息为"看亚运"，地理位置信息为"广州"，创建模块320建立SNS用户A的个人动态信息数据库，该个人动态信息数据库中会记录一条"SNS用户A在广州提交的看亚运"的数据。 Specific examples of the identification number of the SNS user A is 12345, the dynamic personal information submitted to "look at the Asian Games," location information "Guangzhou" to create a dynamic module 320 to establish a personal information database SNS user A, the personal dynamic information database will a record "a look at SNS users submitted in Guangzhou Asian Games," the data. 另外，当SNS用户A在地理位置c处提交新的个人动态信息n，则创建模块320将用户A标识号、信息n及地理位置c 更新存储到SNS用户A的个人动态信息数据库中，如表2所示。 Further, when the SNS user A new personal dynamic information submitted n c at the location, the creation module 320 A user identification number, personal dynamic information and database information n stored in the location updated c SNS user A, as shown in Table 2 shown in FIG. 通知模块330用于在数据库中查找第一SNS用户的好友列表，将该第一SNS用户的个人动态信息、地理位置信息及第一SNS用户标识号通知给该第一SNS用户的好友列表中的第二SNS用户。  The notification module 330 is used to find the first SNS user buddy list in a database, and the SNS personal dynamic information of the first user, the location information of the user identification number and a first SNS notify the first user's friends SNS the second SNS user list. 从SNS服务器上的数据库中查找到第一SNS用户的好友列表，第一SNS 用户的好友列表中至少有一个好友，该至少一个好友为第二SNS用户。 Find the database server to the SNS SNS first user's buddy list, buddy list has at least a first user a SNS friends, friends of the at least one second SNS user. 数据库中存储有各SNS用户的好友列表。 SNS database stores each user's buddy list. 展示模块340用于将该第一SNS用户的个人动态信息、地理位置信息及第一SNS 用户标识号展示在第二SNS用户的好友动态中，方便第二SNS用户查看。  The display module 340 to the first personal dynamic information SNS user, location information, and a first user identification number appear SNS friends dynamic SNS second user, making it easy to see the second user SNS. 如SNS服务器在数据库中SNS用户A的好友列表中有SNS用户B和SNS用户X，SNS用户A在北京提交的香山游记，具体包括SNS用户A提交的个人动态信息为游记的具体内容、地理位置为北京、SNS 用户A标识号为" 1234"，将分别展示在SNS用户A的好友SNS用户B的好友动态和SNS用户X的好友动态中。 SNS SNS such as servers friend list of the user A and user B has SNS SNS users X, SNS user A Beijing Xiangshan Travels filed in the database, including details of personal dynamic information SNS user A filed Travels, location as Beijing, SNS a user identification number "1234", will show multiple friends from your friends in SNS user B's friends SNS SNS user a dynamic and user X's. 表3为SNS用户A的SNS用户X的好友动态的具体记录。 Table 3 shows the user X SNS SNS user A specific buddy dynamic recording. 在表3中， SNS用户X的好友包括SNS用户A、SNS用户B、SNS用户E、SNS用户N等。 In Table 3, SNS SNS user includes a user's friend X A, SNS user B, SNS user E, SNS user N and the like. SNS用户E在地理位置x提交了信息1，用户B在地理位置b提交了信息2,用户N在地理位置b提交了信息4,用户A在地理位置b提交了信息n。 SNS user location E in 1 x submitted information, the user location B 2 b submitted information, the user location N information submitted b 4, the user A geographical information submitted b n. 另外，信息获取模块310、创建模块320和通知模块330为SNS服务器上的运行的模块，展示模块340为终端上的运行的模块。 Further, the information obtaining module 310, a creation module 320 and the notification module 330 running on the SNS server module, the display module 340 is a module running on the terminal. 在一个实施例中，如图4所示，基于地理位置信息展示用户动态的系统除了包括信息获取模块310、创建模块320、通知模块330和展示模块340,还包括查询模块350、筛选模块360和设置模块370。  In one embodiment, shown in Figure 4, location-based information display system comprises, dynamic user information obtaining module 310, a creation module 320, a notification module 330 and display module 340, further comprising a query module 350, filter module 360 ​​and a module 370 is provided. 查询模块350用于获取第二SNS用户选择的展示好友动态的地理位置信息。  Query module 350 is configured to obtain a second selected display buddy SNS user location information dynamically. 筛选模块360用于从第二SNS用户的好友动态中筛选出与该选择的地理位置信息所对应的各好友的个人动态信息。 Screening module 360 ​​for screening personal dynamic information of each of the friend and the geographic location information corresponding to the selected buddy from the second dynamic SNS user. 展示模块340还用于按照该地理位置信息排列显示第二SNS用户好友的用户标识号及好友的个人动态信息。 Display module 340 is further configured to display the personal dynamic information array SNS user information of the second user ID and friends of friends according to the geographic location. 查询模块350获取到第二SNS用户在好友动态中选择一个地理位置信息后，筛选模块360从第二SNS用户的好友动态中可选出在该地理位置信息所对应的各好友的个人动态信息。 After the second query module 350 obtains the user selects a location SNS friends dynamic information, the dynamic filtering module 360 ​​from the second friend SNS user's personal dynamic information may be selected in each of the geographic location of friends corresponding to the information. 第二SNS用户为SNS用户X，SNS用户X的好友中在地理位置b提交个人动态信息的好友标识号及该好友的个人动态信息如表4所示，SNS用户X的好友中在地理位置b提交信息的有SNS用户A、SNS用户B、SNS用户N。 Second SNS SNS user to user X, the dynamic personal information of the user X Friends SNS submit personal information in a dynamic identification number and location b the buddy friends are shown in Table 4, SNS user's friends in the location X b SNS user has submitted the information a, SNS user B, SNS user N.
 另外，第一SNS用户与第二SNS用户互为好友，第一SNS用户的个人动态信息会展示在第二SNS用户的好友动态中，第二SNS用户的个人动态信息也会展示在第一SNS用户的好友动态中，因此上述描述的对第一SNS用户和第二SNS用户的操作可互换。  Further, the first and the second user SNS SNS user mutual friend, the personal information of the first dynamic SNS user appear on the second dynamic friends SNS user's personal dynamic information of the second user will appear SNS friends dynamic first SNS user, so the user operation on the first and second SNS SNS user described above are interchangeable. 查询模块350也可获取第一SNS用户选择的地理位置信息，筛选模块360根据该地理位置信息从第一SNS用户的好友动态中选出与该地理位置信息所对应的各好友的个人动态信息，展示模块340还可用于按照该地理位置信息排列显示第一SNS用户好友的用户标识号及好友的个人动态信息。 Query module 350 can also obtain the first geographic location information selected by the user SNS, dynamic filtering module 360 ​​to select personal information for each friend to the geographical location information corresponding to the first dynamic SNS friends based on the user's location information, display module 340 may also display the personal information for the dynamic information of the first arrangement SNS user's friends and friends of the user identification number in accordance with the geographic location. 设置模块370用于设置第一SNS用户的个人动态信息的链接地址；展示模块340 还用于将该链接地址展示在第二SNS用户的好友动态中。  The module 370 is provided for setting a link address of a first SNS user's personal dynamic information; the display module 340 is further configured to dynamically link address displayed in the second friend SNS user. 设置模块370可设置SNS用户A 提交的个人动态信息的链接地址，并通过展示模块340在SNS用户B的好友动态和SNS用户X的好友动态中展示。 Setting module 370 may set the dynamic link address information of the user A, as individual SNS and SNS displayed in user B's friend buddy dynamic and dynamic SNS user X through display module 340. 查询模块350获取到SNS用户B和SNS用户X触发该链接地址后， 则展示模块340将从SNS服务器的SNS用户A的个人动态数据库中拉取该个人动态信息的具体内容进行查看。 After the personal dynamic database query module 350 to obtain the user B to the SNS and SNS user X trigger the link address, the display module 340 from the SNS server SNS user A dynamic pull of the personal information of the specific content of view. 上述基于地理位置信息展示用户动态的方法及系统，获取第一SNS用户提交的个人动态信息时，同时获取提交该个人动态信息的第一SNS用户所在的地理位置信息，并将该第一SNS用户的个人动态信息、地理位置信息及第一SNS用户标识号展示在第二SNS用户的好友动态中，方便第二SNS用户查不同地理位置的好友个人动态信息。  The method and system based location information showing the user's dynamic, dynamic personal information is acquired first SNS submitted by the user, while acquiring location information of the personal dynamic information submitted first SNS user is located, and the second SNS personal dynamic information of a user, the location information, and a first user identification number appear SNS friends dynamic SNS second user, the second SNS user convenience buddy search personal dynamic information of different geographical locations. 1. 一种基于地理位置信息展示用户动态的方法，包括以下步骤： SNS服务器获取第一SNS用户提交的个人动态信息及提交该个人动态信息的第一SNS 用户所在的地理位置信息，所述个人动态信息包括SNS用户发表的博客、微博、上传的图片、评论的内容、回复的内容、分享的内容、参与的投票、参与的游戏或SNS用户个人信息的更新； 根据该个人动态信息、地理位置信息及第一SNS用户标识号建立第一SNS用户个人动态信息数据库，并存储在SNS服务器中； 所述SNS服务器在数据库中查找第一SNS用户的好友列表，将该第一SNS用户的个人动态信息、地理位置信息及第一SNS用户标识号通知给该第一SNS用户的好友列表中的第二SNS用户，并展示在第二SNS用户的好友动态中； 所述方法还包括步骤： SNS服务器获取第二SNS用户选择的展示好友动态的地理位置信息； 根据该地理位 1. A method for dynamic location information based on the user display, comprising the steps of: SNS server acquires dynamic personal information submitted by a first user and SNS submit geographic location information of the first SNS user personal dynamic information is located, the personal dynamic information includes SNS users published blog, micro-blog, upload pictures, comment content, respond to content, share content, participate in the vote, game or SNS users to update personal information to participate; according to the personal dynamic information, geography a first position information and user identification number to establish a first SNS SNS user's personal dynamic information database, and is stored in the SNS server; the SNS SNS server looks for the first user's buddy list in a database, the first user's personal SNS dynamic information, geographical location information and the first SNS user identification number is notified to the second user SNS SNS friend list of the user in the first, second and displayed dynamic friends SNS user; said method further comprising the step of: SNS SNS server acquires a second user-selected location to show friends dynamic information; based on the geographic location 置信息从所述第二SNS用户的好友动态中筛选出与该地理位置信息所对应的各好友的个人动态信息，并按照该地理位置信息排列显示第二SNS用户好友的用户标识号及好友的个人动态信息。 Filter Friends dynamic location information from the second user in the SNS personal dynamic information of each friend to the geographical location corresponding to the information, and displaying a second SNS user's friends and friends according to the user ID of the location information array personal dynamic information. 2. 根据权利要求1所述的基于地理位置信息展示用户动态的方法，其特征在于，所述SNS服务器获取提交该个人动态信息的第一SNS用户所在的地理位置信息的步骤具体是： 获取提交该个人动态信息的移动通信终端的地理坐标信息；根据所述地理坐标信息及地理信息系统，得出提交该个人动态信息的第一SNS用户所在的地理位置信息。 The location-based dynamic user information presentation method according to claim 1, wherein the geographic location information of the SNS server acquires dynamic personal information submitted by the user is a first step of SNS particular: acquiring Submit the geographic location information of said geographical coordinate information and geographical information system, the personal dynamic information submitted derived first SNS user is located; geographic coordinate information of the mobile communication terminal the dynamic personal information. 3. 根据权利要求2所述的基于地理位置信息展示用户动态的方法，其特征在于，根据所述地理坐标信息及地理信息系统，得出提交该个人动态信息的第一SNS用户所在的地理位置信息的步骤具体为：将所述移动通信终端的地理坐标信息与地理信息系统中存储的地理坐标进行匹配，得出该移动通信终端的地理坐标信息所对应的地理位置。 3. The method of dynamic geo-location information based on a user display, wherein according to claim 2, according to the geographic coordinate information and geographical information systems, the derived geographic submit personal dynamic information in the first user's SNS step information is specifically: the geographical coordinates of the geographical coordinates of the mobile communication terminal and information stored in the geographic information system matches geographical coordinates obtained information of the mobile communication terminal corresponding to the location. 4. 根据权利要求1所述的基于地理位置信息展示用户动态的方法，其特征在于，还包括步骤：设置所述第一SNS用户的个人动态信息的链接地址；将所述链接地址展示在第二SNS用户的好友动态中。 The location-based dynamic user information presentation method according to claim 1, characterized in that, further comprising the step of: setting the first link address SNS user's personal dynamic information; the display at the link address two SNS user's friends dynamics. 5. -种基于地理位置信息展示用户动态的系统，其特征在于，包括： 信息获取模块，用于获取第一SNS用户提交的个人动态信息及提交该个人动态信息的第一SNS用户所在的地理位置信息，所述个人动态信息包括SNS用户发表的博客、微博、上传的图片、评论的内容、回复的内容、分享的内容、参与的投票、参与的游戏或SNS用户个人信息的更新； 创建模块，用于根据所述个人动态信息、地理位置信息及第一SNS用户标识号建立第一SNS用户个人动态信息数据库； 通知模块，用于在数据库中查找第一SNS用户的好友列表，将所述第一SNS用户的个人动态信息、地理位置信息及第一SNS用户标识号通知给该第一SNS用户的好友列表中的第二SNS用户； 展示模块，用于将该第一SNS用户的个人动态信息、地理位置信息及第一SNS用户标识号展示在第二SNS用户的好友动态中； 所述 5. - kind of location-based dynamic user information presentation system comprising: an information obtaining module, configured to obtain a first personal dynamic information submitted SNS user geographic and submit the first SNS user's personal dynamic information where location information, the personal dynamic information includes SNS users published blog, micro-blog, upload pictures, comment content, respond to content, share content, participation in voting, participating in the game or SNS update your personal information; to create module for the dynamic personal information, geographical location information and a first user identification number to establish a first SNS SNS user's personal dynamic information database; notification module, configured to find a first SNS user's buddy list in the database, the second SNS user buddy list personal dynamic information SNS said first user, location information, and a first user identification number SNS notify the first user of the SNS; displaying module, for dividing the first user's personal SNS dynamic information, geographical location information and the first SNS user identification number displayed in the second friend activity of SNS user; the 统还包括查询模块和筛选模块，所述查询模块用于获取第二SNS用户选择的展示好友动态的地理位置信息，所述筛选模块用于从所述第二SNS用户的好友动态中筛选出与该地理位置信息所对应的各好友的个人动态信息，所述展示模块还用于按照该地理位置信息排列显示第二SNS用户好友的用户标识号及好友的个人动态信息。 The system further comprising a query module and a filtering module, a query module configured to obtain a second selected display SNS user buddy dynamic geographic location information, said screening module for screening a dynamic friends of the second user with SNS personal dynamic information of each buddy information of the location corresponding to the display module is further arranged to display information personal dynamic information of the second user's friends SNS user ID and friends according to the geographic location. 6. 根据权利要求5所述的基于地理位置信息展示用户动态的系统，其特征在于，所述信息获取模块还用于获取提交该个人动态信息的移动通信终端的地理坐标信息，根据所述地理坐标信息及地理信息系统，得出提交该个人动态信息的第一SNS用户所在的地理位置信息。 The location-based dynamic user information presentation system according to claim 5, characterized in that the geographical coordinates information acquisition module is further configured to obtain information of the mobile communication terminal to submit the personal dynamic information according to the geographical coordinate information and geographic information systems, geographic information submitted to obtain the personal information of the first dynamic SNS user is located. 7. 根据权利要求6所述的基于地理位置信息展示用户动态的系统，其特征在于，所述信息获取模块还用于将所述移动通信终端的地理坐标信息与地理信息系统中存储的地理坐标进行匹配，得出该移动通信终端的地理坐标信息所对应的地理位置。 The location-based dynamic user information presentation system according to claim 6, wherein the information acquiring module is further configured to geographic coordinates of the mobile communication terminal with geographical coordinate information stored in the GIS matching obtain geographical coordinates information of the mobile communication terminal corresponding to the location. 8. 根据权利要求5所述的基于地理位置信息展示用户动态的系统，其特征在于，还包括与所述展示模块相连的设置模块，所述设置模块用于设置所述第一SNS用户的个人动态信息的链接地址；所述展示模块还用于将所述链接地址展示在第二SNS用户的好友动态中。 The location-based dynamic user information presentation system according to claim 5, characterized in that, further comprising a setting module connected to the display module, the module is provided for setting the first user's personal SNS dynamic link address information; the display module is further configured to display the link address in a second dynamic friends SNS user.